Is CEAL® Right for You? Are you an experienced assisted living executive looking for a competitive edge in the marketplace? Are you interested in obtaining the necessary skills to successfully lead an assisted living community in Ohio or, even possibly, nationwide? Then CEAL® is the certification for you! Ohio CEAL® is a comprehensive certification program designed to elevate the skills and professionalism of assisted living administrators in Ohio by combining national competency standards along with Ohio's most comprehensive state-specific training. While the state of Ohio does not require a certification or license to be an administrator of a residential care facility (RCF), several states do require their assisted living administrators to be licensed. Therefore CEAL® aligned its program curriculum with the National Association of Long Term Care Administrator Boards (NAB) Residential Care/Assisted Living Administrators Licensing Examination thereby allowing credentialed assisted living executives in Ohio to meet national competency standards. 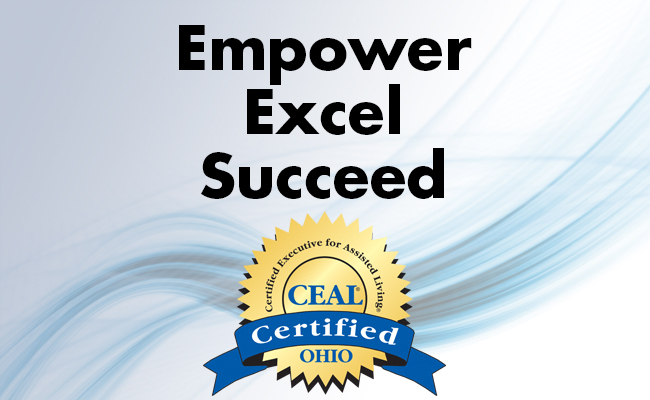 Obtaining the Ohio CEAL® will empower you to excel in the profession you love. And it will enhance your distinction within Ohio's growing and competitive assisted living marketplace.